Objective: This study was conducted to evaluate the parents' awareness and attitude toward emergency management of avulsed tooth in AL-Baha city. Materials and Methods: Eleven-item questionnaire form was designed and sent randomly to parents with different demographic characteristics in Al-Baha city. A total of 263 questionnaires were collected. Data were statistically analyzed using SPSS program. Results: The majority of the respondents (n = 227; 86.3%) were females. The result revealed insufficient awareness among parents regarding the emergency management of tooth avulsion. One hundred fifty-two (58%) of the respondents think that replantation of an avulsed tooth is impossible where 76% (n = 202) of the parents were not aware of the transportation medium for the avulsed tooth. The demographic characteristics showed a nonsignificant impact on the awareness and attitude toward emergency management of the avulsed tooth in this study (P < 0.05). Conclusion: This study showed an insufficient awareness regarding tooth avulsion among Saudi subpopulation. Children are frequently exposed to a variety of traumatic injuries which affect their teeth and the supporting structures. Parents and dentists are responsible for the survival of traumatized teeth. About 0.5%–18.3% of dental traumatic injuries were contributed to avulsion of the permanent maxillary incisor teeth.,, Tooth avulsion describes a situation in which a tooth is completely displaced from its socket due to trauma. Maxillary incisors of 7–11-year-old children are the most commonly affected. An immediate replantation is very important for good prognosis., However, the periodontal ligament tissue should be kept viable in case of delayed replantation. The prevalence of the dental traumatic injuries reported in Saudi children in Riyadh city was 33% out of 3441 teeth with an avulsion rate of 0.3%. Al-Malik reported a 3% avulsion among 112 patients attending emergency and dental departments of hospitals in Jeddah, Saudi Arabia. al-Nazhan et al. evaluated the complications of the delayed managements of traumatized permanent teeth of Saudi patients. They suggested educational programs to raise the trauma awareness as well as motivation of parents and the public to seek immediate treatment following dental injury. The knowledge of the parents is essential for proper management of the avulsed teeth. Different studies have been conducted to estimate the parents' knowledge regarding management of avulsed permanent teeth in Saudi Arabia., The overall results of these studies showed low level of awareness toward dental trauma. However, to the best of our knowledge, no one has been conducted among parents in AL-Baha city. Since different demographic characteristics could have an impact on the level of awareness and attitude, therefore this study was conducted to evaluate the parents' awareness and attitude toward emergency management of avulsed tooth in AL-Baha city. The study has been registered and ethically approved by the Restorative Dental Science Research Committee in the College of Dentistry of AL-Baha University and the Education Department of Al-Baha Dental Center (#3414218). The research has been conducted in full accordance with the World Medical Association Declaration of Helsinki. Data were sent randomly to Saudi parents living in AL-Baha city of the Kingdom of Saudi Arabia. The participants were randomly chosen from the medical records of the Pediatric Department in AL-Baha Dental Center. The participants were asked to fill up the questionnaire if they agree to do so. The questionnaire that was prepared for this study is a modified version of the questionnaire that was adopted by Raphael and Gregory. The questionnaire consisted of two parts. In the first part, the demographic characteristics (i.e., gender, education level, and geographic status) have been evaluated whereas the second part consisted of the questions that measure their knowledge and attitude regarding emergency care of tooth avulsion. The data were collected in Microsoft Excel sheet and analyzed using SPSS program for Windows, version 16 (SPSS Inc., Chicago, IL, USA). Chi-square test was applied to evaluate the association between the results and the gender, educational level, and age of the participants. The variable presenting P < 0.05 was considered statistically significant. The total respondents were 263 as shown in [Table 1]. Thirty-six (13.7%) of them were males and 227 (86.3%) were females. The majority of the respondents were from 30 to 40 years' age group. One hundred sixty (60.8%) of the respondents belong to the undergraduate group and only 34 (12.9%) of them were having a postgraduate degree. 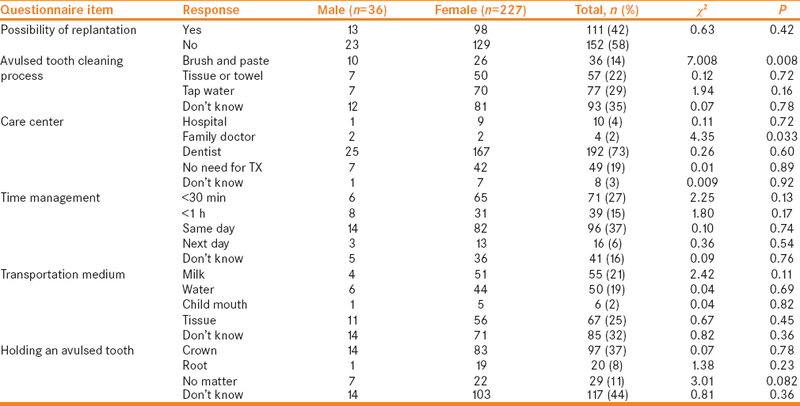 The items of the questionnaire that measured the awareness and the previous information about dental trauma in comparison to the gender of the respondents showed an insignificant difference between females and males except for the previous exposure to information in which the difference was statistically significant, P = 0.026 as shown in [Table 2]. There was a significant difference between males and females when measuring the early managements of the avulsed tooth. 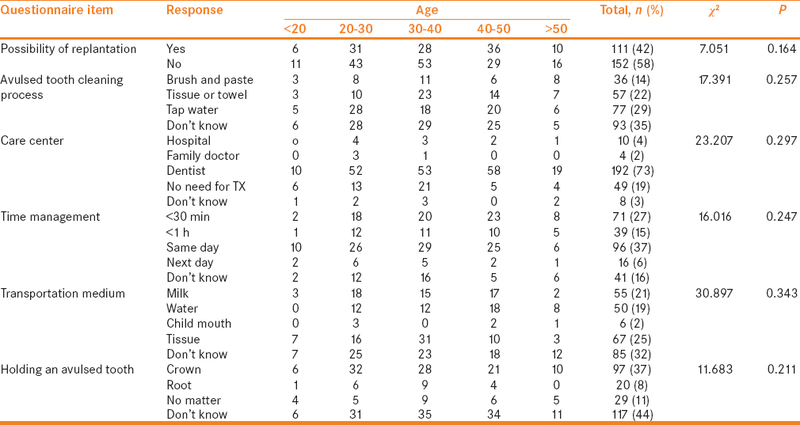 Ten (27%) of the male respondents stated that they will clean the avulsed tooth using brush and paste compared to 26 (11%) of the female respondents. The dentist was their first choice to treat the avulsed tooth, as shown in [Table 3]. Most of the respondents (58%) do not think that the avulsed tooth can be replanted; however, the difference was not statistically significant, P = 0.42. 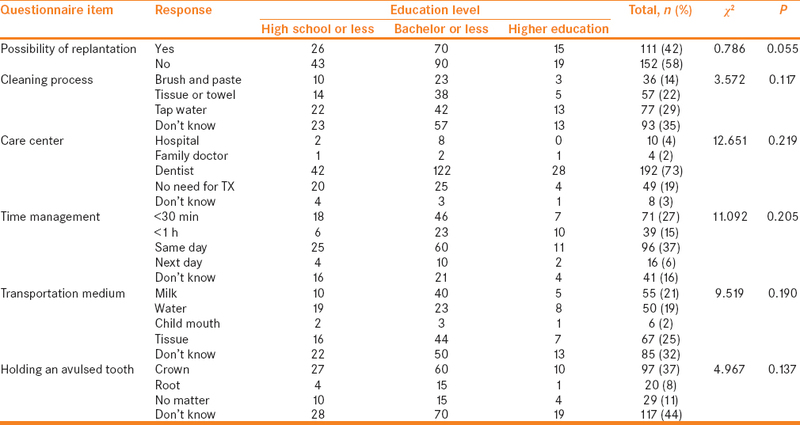 No significant differences were noticed between different age groups or educational levels in comparison to the knowledge and management of the avulsed tooth, as shown in [Table 4], [Table 5], [Table 6], [Table 7]. The main objective treatment of replanting an avulsed tooth was to retain it in its socket to maintain the patient's esthetic appearance and occlusal function in addition to prevent root resorption. Knowledge of managing an avulsed tooth is important for the public, teachers, and dentists as well., According to Al-Obaida, the majority of Saudi primary schoolteachers in Riyadh, Saudi Arabia, do not know how to handle a child who sustains dental injury, while AlJazairy et al. found that the dentists working in Riyadh have a moderate knowledge about permanent tooth avulsion and its management. In accordance with the previous studies,, that were conducted to measure the knowledge and awareness toward dental trauma, this study revealed insufficient awareness among parents regarding the emergency management of tooth avulsion that could be due to lack of proper sufficient knowledge regarding dental trauma although 53% of the participants gave positive response when they were asked about their previous information about dental trauma. Storage media such as Hank's balanced salt solution and milk were considered to be the best examples of osmolality-balanced media for storing an avulsed tooth. Natural products such as coconut water, propolis, and green tea have been used and showed their ability to maintain the viability of periodontal ligament cells of avulsed teeth. Milk is usually available at home or in grocery where a patient can easily find if trauma occurs. The use of milk as storage of the avulsed tooth has been reported to preserve the viability of periodontal ligament cells for up to 60 min at room temperature, and if refrigerated, it will preserve them for an additional 45 min., In the current study, only 21% gave a proper response regarding transportation medium of the avulsed tooth. This finding does not have any correlation with the demographic characteristics that have been examined. This was in accordance with the study that was conducted by Alshammari et al. and showed only 20% of the respondents who were aware of the use of milk as a transportation medium of the avulsed teeth. A high percentage (58%) of the parents would discard the avulsed tooth, due to lack of knowledge of the possibility of reimplantation. Similar results were seen in the study conducted by Alghamdi et al., Alshammari et al., and Andersson et al. where only a less percentages of the respondents were aware of a possibility of replantation. According to (IADT) guidelines, the avulsed tooth should not be replanted if the toothis badly decayed, the periodontitis is severe and if the patient is not cooperative or having an immunosuppresion or severe cardiac disease. The prognostic outcome of replanting an avulsed tooth depends on appropriate management immediately after the trauma. This has been reported in several numbers of experimental and clinical studies.,,, The main prognostic factors for better outcome of replanting the avulsed tooth are minimal extraoral time, appropriate transporting medium with minimal damage to root surface, and periodontal ligament., Unlike the result of the study that was conducted in Brazil by Santos that showed 99% of the respondents will seek immediate care of the avulsed teeth, only 27% of the parents according to this study would consider immediate care (i.e., in <30 min) for the avulsed tooth, while 43% of the parents think that it is better to wait till the child will be stable and asymptomatic. The management of avulsed tooth was not known to big number of respondents. No significant difference was found between males and females (P = 0.72). The males have a significantly (P = 0.008) higher tendency to clean the avulsed tooth incorrectly using brush and paste (17%) compared to the female respondents (12%). Similar findings were reported.,, This will result in total damage of the periodontal ligament tissue that resulted in the failure of replantation. This indicated that the gender of the respondents showed a nonsignificant impact on the awareness and attitude toward emergency management of the avulsed tooth in this study. According to the IADT recommendation, the avulsed tooth should be briefly washed for a maximum of 10 s under cold running water at the accident site before repositioning it in the socket. In addition, the IADT stressed in cleaning the root surface with a saline in cases in case the avulsed tooth has been stored dry and extraoral dry time was <60 min. Furthermore, Andreasen et al. recommended that, after removing necrotic periodontal tissue, the teeth should be soaked in 2.4% acidulated sodium fluoride solution with a 5.5 pH for 20 min before extraoral root filling and replantation. Although elderly persons might be exposed to traumatic accidents more frequently which may increase the level of experience, and the knowledge acquired from the accumulated experiences, there was no significant difference in relation to the association between age and level of awareness toward management of the avulsed teeth. The same is applied to the level of education that showed a negative correlation response with the level of knowledge and awareness about tooth avulsion and its management. The parents who participated in this study showed insufficient knowledge in how to manage dental trauma to their child. Therefore, it is important to plan educational programs in the society to increase their awareness. Santos ME, Habecost AP, Gomes FV, Weber JB, de Oliveira MG. Parent and caretaker knowledge about avulsion of permanent teeth. Dent Traumatol 2009;25:203-8. Lygidakis NA, Marinou D, Katsaris N. Analysis of dental emergencies presenting to a community paediatric dentistry centre. Int J Paediatr Dent 1998;8:181-90. Andreasen J, Andreasen F, Andersson L. Text Book and Color Atlas of Traumatic Injuries to the Teeth. 4th ed. Copenhagen: Blackwell Munksgaard; 2007. p. 444-8. Guedes OA, de Alencar AH, Lopes LG, Pécora JD, Estrela C. A retrospective study of traumatic dental injuries in a Brazilian dental urgency service. Braz Dent J 2010;21:153-7. Andersson L, Andreasen JO, Day P, Heithersay G, Trope M, Diangelis AJ, et al. International association of dental traumatology guidelines for the management of traumatic dental injuries: 2. Avulsion of permanent teeth. Dent Traumatol 2012;28:88-96. Krasner P, Rankow HJ. New philosophy for the treatment of avulsed teeth. Oral Surg Oral Med Oral Pathol Oral Radiol Endod 1995;79:616-23. Al-Majed I, Murray JJ, Maguire A. Prevalence of dental trauma in 5-6- and 12-14-year-old boys in Riyadh, Saudi Arabia. Dent Traumatol 2001;17:153-8. Al-Malik M. Oral injuries in children attending a hospital in Saudi Arabia. J Maxillofac Oral Surg 2009;8:34-9.
al-Nazhan S, Andreasen JO, al-Bawardi S, al-Rouq S. Evaluation of the effect of delayed management of traumatized permanent teeth. J Endod 1995;21:391-3. AlGhamdi NS, Alothman SA, Assiri AM, Bijle MN, Togoo RA. Knowledge of Saudi parents toward the emergency management of avulsed permanent teeth: A cross-sectional survey. J Dent Res Rev 2016;3:85-7. AlShammari AF, Aldakhil NM, Alshammari HS, Alsairafi MA, Al-Saif EA, Abduldayem AO. Knowledge and practice of Saudi civilians towards management of dental trauma and avulsed tooth. J Dent Health Oral Disord Ther 2017;6:183. Raphael SL, Gregory PJ. Parental awareness of the emergency management of avulsed teeth in children. Aust Dent J 1990;35:130-3. Rao A, Kommula A, Tummala M. Delayed replantation after prolonged dry storage. Saudi Endod J 2014;4:91-4. Al-Obaida M. Knowledge and management of traumatic dental injuries in a group of Saudi primary schools teachers. Dent Traumatol 2010;26:338-41. AlJazairy YH, Halawany HS, AlMaflehi N, Alhussainan NS, Abraham NB, Jacob V, et al. Knowledge about permanent tooth avulsion and its management among dentists in Riyadh, Saudi Arabia. BMC Oral Health 2015;15:135. Jain D, Dasar PL, Nagarajappa S. Natural products as storage media for avulsed tooth. Saudi Endod J 2015;5:107-13. Blomlöf L, Lindskog S, Hammarström L. Periodontal healing of exarticulated monkey teeth stored in milk or saliva. Scand J Dent Res 1981;89:251-9. Lekic P, Kenny D, Moe HK, Barretti E, McCulloch CA. Relationship of clonogenic capacity to plating efficiency and vital dye staining of human periodontal ligament cells: Implications for tooth replantation. J Periodontal Res 1996;31:294-300. Andersson L, Al-Asfour A, Al-Jame Q. Knowledge of first-aid measures of avulsion and replantation of teeth: An interview of 221 Kuwaiti schoolchildren. Dent Traumatol 2006;22:57-65. Rhouma O, McMahon AD, Welbury RR. Early prognostic indicators and outcome prediction model for replanted avulsed teeth. Eur Arch Paediatr Dent 2012;13:203-9. Cvek M, Granath LE, Hollender L. Treatment of non-vital permanent incisors with calcium hydroxide 3. Variation of occurrence of ankylosis of reimplanted teeth with duration of extra-alveolar period and storage environment. Odontol Revy 1974;25:43-56. Andreasen JO. Effect of extra-alveolar period and storage media upon periodontal and pulpal healing after replantation of mature permanent incisors in monkeys. Int J Oral Surg 1981;10:43-53. Heimdahl A, von Konow L, Lundquist G. Replantation of avulsed teeth after long extra-alveolar periods. Int J Oral Surg 1983;12:413-7. Andersson L, Blomlöf L, Lindskog S, Feiglin B, Hammarström L. Tooth ankylosis. Clinical, radiographic and histological assessments. Int J Oral Surg 1984;13:423-31. Robertson A, Norén JG. Knowledge-based system for structured examination, diagnosis and therapy in treatment of traumatised teeth. Dent Traumatol 2001;17:5-9. Namdev R, Jindal A, Bhargava S, Bakshi L, Verma R, Beniwal D. Awareness of emergency management of dental trauma. Contemp Clin Dent 2014;5:507-13.